Ladies and gentlemen! Children of all ages! 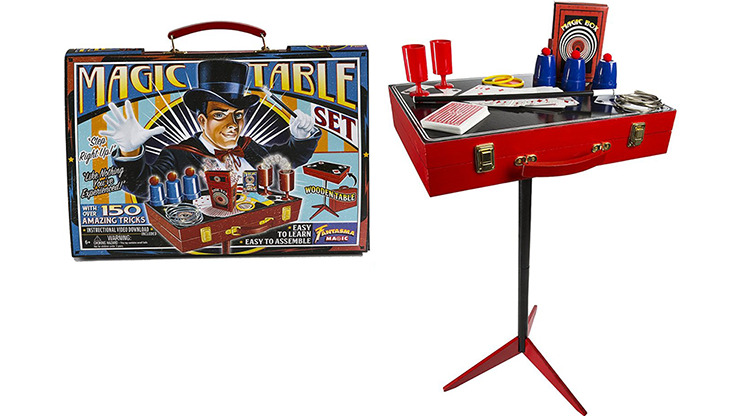 Step right up to the Fantasma Magic Table Set! Spectators will gasp in amazement as you make coins vanish and reappear, as you produce mountains of candy, magically link rings, and so much more! Magic play is great for hand-eye coordination, public speaking skills and building self-confidence, and this set has everything you need to get started today. It includes cups, balls, rings, a magic wand, flying coins, magic box, money paddle, magic cards, bizarre boomerangs, vanishing coin, as well as a downloadable instructional video and Book of Secrets, which will help you perform over 150 amazing magic tricks! All of these tricks and more fit inside the beautifully painted and detailed retro-look wooden table case. This is not only a perfect platform to perform your favorite tricks, it also makes storage and transport to your next venue completely hassle free. As with all of Fantasma's products, the Magic Table Set is endorsed by the International Brotherhood of Magicians-the only magic products on the market today to carry this seal. Perfect for ages 6 and up.